At a certain point, every Product team will need to justify its existence, whether there is a new CEO that views Product as a cost center or product lines are deprioritized, it is important to both understand and be able to articulate the value product management provides. While we will explore each of the above separately, the value of product management specifically is in ensuring that the right problems are identified and the right solutions are built to solve those problems. First, let’s examine the value in identifying the right problem and define what the “right problem” means. Right Problem Definition - Right problem in the context of product management means that the underlying user need, not simply the need the user superficially volunteers, has been identified to the greatest extent possible. Regardless of the accuracy of the quote, it perfectly encapsulates the identification of the user’s superficial problem (that the existing mobility solution could be faster/better/cheaper) versus the identification of the user’s underlying need (improving a users ability to move independent of the method in which they are transported). More simply, users didn’t want a faster horse, they wanted a faster method of transportation. The right solution to each of these problems is quite different. This can also be seen as thinking through the problem from a first principles perspective. While it might appear obvious why identifying the right problem is valuable, it is also important to be able to articulate the reasoning to stakeholders that may not be aware of product management methodology. If your product team does not identify the right problem, there is a close to zero chance that the product team will derive the right solution by chance. This is the same fundamental reason that existing companies often fail to identify up and coming competitors and disruptors - they are focused on solving the right problem for a prior time period and have not adjusted for new technological/societal/preferential catalysts. Identifying the right problem is even more valuable than identifying the right solution, because if you have identified the right problem, your product team will likely ultimately be able to pivot to the right solution via trial and error. If you have identified the wrong problem, your product team will be unable to create the maximum value possible because it will be attempting to figure out different ways to make a horse faster, not invent an entirely new method. Finally, identifying the right problem can provide opportunities in markets that appear to be saturated with solutions, but upon closer inspection, are saturated with wrong solutions to the wrong problems. Second, let’s understand what the right solution looks like and what the “right solution” means. Right Solution Definition - Right solution in the context of product management means that the underlying user need, not just the need the user has identified, has been satisfied to the greatest extent possible, inclusive of the tradeoffs that the product team has identified in providing that solution relative to other stakeholders. At its core, providing the right solution is about allowing your company to capture the greatest amount of value from your customers. Providing the right solution to each customer is the root cause behind increases in customer lifetime value, Net Promoter Score, loyalty/retention and every metric that product teams seek to optimize. In contrast to the criticality in identifying the right problem initially, it isn’t critical to identify the most optimal right solution at first, but only to produce a right solution based on the correct factors that influence the most optimal solution. If those factors are identified, and the cost of iteration can be minimized, iteration/trial and error is likely a more optimal path than upfront effort. More simply, if the right solution to air travel is an airplane versus an airship, the optimal number of seats, their materials, and the ticket prices are all variables that can be iterated upon after the fact, while the choice of utilizing an airplane versus an airship is costly. The examples below will explore instances where the right problem / right solution were identified/built (Good PM), as well as cases where the right problem/wrong solution, the wrong problem / right solution, and wrong problem / wrong solution were identified/built (Bad PM). It is important to note that PM discussion/case studies are always in hindsight - it is much more difficult to identify these issues in real time, but without a Product team, there is a zero percent chance that those issues will ever be identified. When I refer to Bad PM, I specifically mean that these are examples where the right problem or right solution was not identified, not that those Product teams are of poor quality or low skill. In addition, it is difficult to identify Wrong Problem/Wrong Solution and Wrong Problem/Right Solution examples because those companies have either ceased operations or pivoted to a new business model entirely. 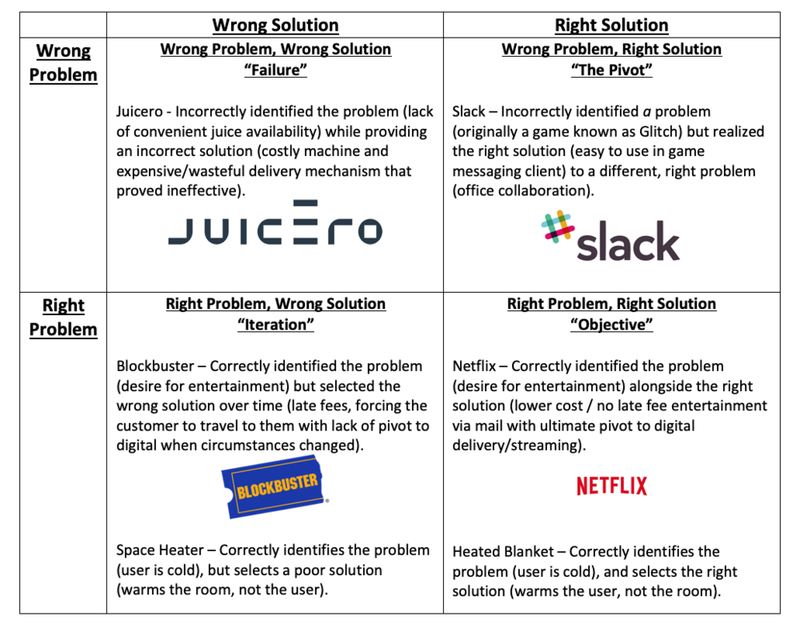 A Note on Pivots (Wrong Problem, Right Solution) - It could be argued that some of the most successful technology companies have been the result of pivots, and that product teams should follow the adage of throwing things at the wall to see what sticks. This approach fails to consider the value that attempting to identify the right problem first can provide in terms of time and cost savings while overweighting a product team’s skill at identifying the right solution they have developed is misapplied. This scenario most likely results in total failure rather than a pivot to a successful product.